If you’re unfamiliar with Crime Prevention through Environmental Design (CPTED), the basic premise is that “proper design and effective use of buildings and public spaces in neighborhoods can lead to a reduction in the fear and incidence of crime,” according to the National Crime Prevention Council. This can direct neighborhood design, helping developers create a safer community. It can also direct the security efforts you take with your rental property. When you boost rental security in this way, you’ll also improve curb appeal and landscaping, making it a win-win for you, your tenants and the community. Use these landscaping upgrades to bring CPTED to your rental property. Mounting lamps in the front yard is a decorative and functional means of exposing would-be trespassers. Without the cover of the dark, burglars have increased chances of being seen. During installation, position the light fixtures away from areas that cause shadows or glaring, in order to illuminate the entire property after dark. It’s also a smart idea to elevate them high enough to inhibit tampering. Finally, the most effective options for security lighting are high-intensity and motion sensitive discharge bulbs—in particular, metal halide or high-pressure sodium (HPS): “The HPS bulbs emit a yellow to orange light, while the metal halide bulbs emit a blue to white light,” according to Angie’s List’s Outdoor Lighting Guide. Overgrown shrubbery is not only an eye sore, but creates a convenient hiding place for intruders, allowing them to gain access through first-floor windows. When you trim the property’s bushes on a regular basis, you also “increase visibility of the yard, so neighbors will be able to spot suspicious activity,” suggest security experts from Phoenix Lockmaster. Tree branches close to the second-story windows or overhanging the roof can present a safety hazard. Intruders can climb a tree in order to reach these entry points. “Look closely at upper-floor windows. If there’s a roof, ledge, fire escape or ladder nearby…remember that you need to secure those windows,” says former FBI criminal profiler Gregg McCrary. Besides keeping windows locked, ensure that there is several feet of space between the tree limbs and windows or roof. In addition, consistent pruning is essential for your trees, otherwise burglars have direct access to a vulnerable area within the home. Installing a fence around the whole property to enclose it from street-view makes the property more private and secure. 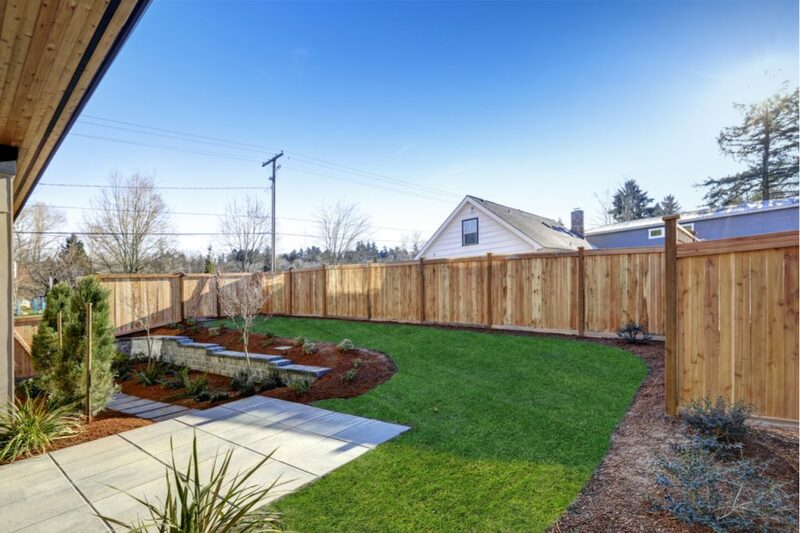 When choosing a fence, note that the most resilient and safest materials are wood, aluminum or polyvinyl chloride (PVC), and the recommended height should be about six to eight feet. Protect America suggests that a fence should have sufficient locking mechanisms, padlocked gates and no exposed crawl spaces. This will deter trespassers from scaling over your fence on the outside. Thieves are attracted to front lawns that allow them to move across quietly, without drawing attention to themselves. Cover the ground near windows and doors with gravel to discourage would-be intruders from encroaching on your space. The loud crunch of footsteps will force a burglar to search for another target, experts suggest from Houzz. A successful break-in requires the elements of silence and unpredictability. Not to mention, gravel is an aesthetic feature that upgrades curb appeal. The yard is your property’s first line of defense against potential threats. Configure and design the landscape to serve a dual purpose of beauty and safety. Integrate these simple tips to give yourself and your tenants peace of mind. Jessica Thiefels is a professional freelancer and consultant who has been writing and editing for more than 10 years. Thiefels has worked with a variety of real estate clients and publishers, and has been featured on Forbes and Market Watch. She is also an author for Inman, House Hunt Network, Homes.com and more.